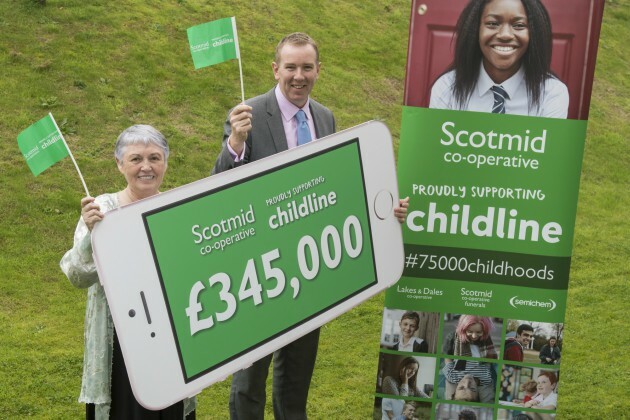 Scotmid Co-operative announced that it has raised a staggering £345,000 for Childline, beating its original fundraising target by 15 per cent. The money raised will allow the NSPCC-run confidential advice service for children to answer approximately 85,000 calls, emails and online messages from young people who need someone to listen to them. Elaine Chalmers, Head of Childline in Scotland, joined Scotmid colleagues including those from Semichem, Lakes & Dales Co-operative and Scotmid Co-operative Funeral Directors, and CEO John Brodie at an event in Edinburgh to celebrate their fundraising success. The year-long partnership with the charity saw stores hold various fundraising activities, from dress down days and raffles to skydives, triathlons and long-distance cycle rides. Childline provides vital free and confidential support 24/7 to desperate children and young people over the phone and online. As part of the partnership, Scotmid also actively promoted ways that staff and customers can volunteer for the helpline to counsel children and young people on a range of topics including mental health issues, family problems, body image, bullying and abuse. Elaine Chalmers, Service Head of Helplines for Childline in Scotland, said: “The enthusiasm and sheer hard work of the Scotmid family has been overwhelming. Childline volunteers and staff are proud to be associated with this effort. John Brodie, Chief Executive of Scotmid Co-operative added: “Childline is such a valuable service for children and young people in our communities so we are absolutely delighted to have partnered with the charity and surpass our fundraising target. Dame Ester Rantzen, who founded Childline over 30 years ago, was unfortunately unable to attend the event due to ill health but shared a congratulatory video with the Scotmid team. She said: “I have had the great pleasure of meeting the Scotmid team and I was enormously impressed by their vision, passion and commitment to the welfare of children. “Childline helps and protects young people who have nowhere else to turn we know we save lives and protect them from pain but our challenge is to answer every child who needs us.